Crisp, crunchy, fragrant, packed with herbs and fresh vegetables. 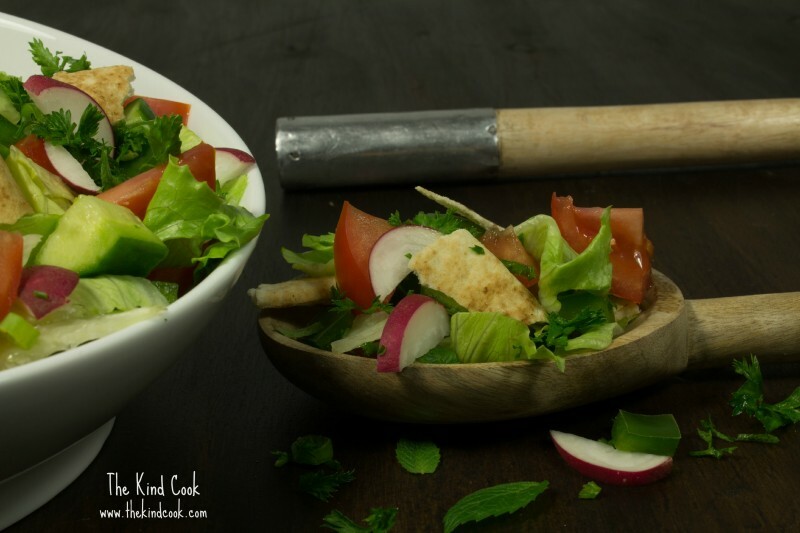 Fattoush Salad is the perfect accompaniment to any Middle Eastern inspired meal. Preheat your oven to 180c. Place the Lebanese bread in the oven and bake it until it is crispy. Break the dried bread into pieces and place it in a bowl along with all the salad ingredients. Whisk all the dressing ingredients together and add them to the salad. Stir everything well to combine and serve. Time: 10 – 15 minutes of preparation, plus the cooking time. I preheat my oven and cook my bread while I am preparing all the other ingredients.